Who really appeals to US independent voters? is the purest fantasy. Forsyth can hardly believe that Bill's remarks about Jesse Jackson fall into Willie Horton territory. Bill's remarks were unwise, but Obama's tetchiness in the face of any criticism has been one of his least attractive traits; against real opposition from the formidable Republican machine, it could be his undoing. The truth is, however, that either candidate would be immeasurably better than the dismal John Kerry in 2004 (I'd keep quiet about that endorsement if I were Obama). But Obamaphiles shouldn't exaggerate their guy's strengths or underestimate those of his opponent for the Democratic nomination. I have written the cover feature for this week's Public Finance magazine, about the Children's Plan, and the tensions between the children's and school standards agenda that the Plan seeks to bridge. You can read the article here. Despite their chastening experience in New Hampshire, much of the British media have reverted over the last week to their conviction that Barack Obama will sweep all before him in the US elections. Florida has certainly separated out the Republican contenders, finishing Giuliani's prospects. But it has also delivered Hillary Clinton a stunning victory with a turnout higher than in other states. Despite the refusal of the Democratic party nationally to recognise Florida's delegates (as with Michigan, the state opted for an early primary against their wishes), she won 50% of the vote - with over 800,000 people voting for her - in the face of Barack-fever and the Ted Kennedy endorsement. Sure, this will have meant big Hispanic support, and Obama still carries some younger voters and has big leads among African-Americans. But last night's result suggests that Super Tuesday, where Hillary has double-digit leads in most states, including California, New York and New Jersey, will be a day of disappointment for the biased British media. I've never been terribly impressed by the annual whinge about students taking part-time jobs to supplement their interest-free student loans while pursuing their undergraduate courses. It is commonplace in many countries; the right job is good on the CV; and the best universities, like Warwick, integrate it into their undergraduate offer. But there are limits. The patronising sneer that greeted news that qualifications awarded by McDonalds, Flybe and Network Rail are to be treated on a par with those developed by the exam boards illustrates all that is wrong with the British attitude to qualifications. It is far better to have good vocational qualifications developed by successful businesses than exam boards; and it is right that the Qualifications and Curriculum Authority should do all it can to ensure that those who achieve them can use them when they move to other companies. The problem with vocational qualifications has been their divorce from the needs of business; and the problem with the regular complants from the CBI and others about the readiness of young people for the world of work has been the unwillingness of business to engage with the education and training curriculum. This approach solves both problems at a stroke. With plans for compulsory training until 18, including for the 15% of young people in work without 'recognised training', there will need to be many more such qualifications accredited. And that is a good thing - for young people and business. Time for a bit of parochialism. The protest by anti-First Great Western campaigners seemed to have fizzled out by the time we got to Keynsham (where we live) and Bath stations this morning, my daily commute. But the protesters have done a splendid job in drawing attention to the failings of the West's rail services. Our train was not overcrowded but was ten minutes late today due to a 'mix-up over platforms' at Bristol; I arrived back from London to Bath on Thursday twenty minutes late, and five minutes after the hourly connection to Keynsham had left. And there is a lot in their arguments about the unreliability of the service; and the £140 peak return fare from Bristol to London is daylight robbery (it is £48 as a saver, and less if you book off-peak in advance). Some services operate with too few carriages. However, that is not the whole story. Much as it galls me to say anything good about FGW, their service from Keynsham and other smaller stations around Bristol and Bath is better than that offered by Wessex trains: there is (when it runs properly) an hourly service; there are reasonable connections; and there are more direct trains to places like Bristol Parkway, Cardiff, Gloucester and Swindon. Moreover, the local fares have not had the same crazed increases as the London services. All of this, I think, we can attribute to the campaign against plans to cut Keynsham services two years ago, which were greeted by 8000 individual protests. But then having spent fifteen years on London's Northern Line and my teenage years waiting 40 minutes for never-arriving Dublin buses, it is possible to have a sense of proportion about one's daily ten minute commute! Good to see Alan Johnson robustly rebutting the absurdly overblown allegations which the BBC thinks are the most important news story of the day. Most politicians are not crooks or deliberately deceptive. But the idea that every donation is dodgy, every donor devious and every politician bent is destroying our democracy. Registering donations late on one register while you have already done so on another is a transgression, not a hanging offence, since there is hardly a deliberate attempt to deceive; not knowing that somebody asked their brother (who is both on the electoral register and a party member) to donate a few thousand pounds on your behalf is not illegal at all. It is about time we got a sense of proportion about all this. Unless we do, as I have argued here before, every party - and our democratic system - will be the losers. Today's news that hundreds of village schools face the axe is worrying. In 1998 David Blunkett and Stephen Byers introduced unprecedented protection for the village school, after 450 closures under the Tories, in recognition of their singular contribution to rural life. With falling rolls and shortages of primary headteachers, as well as expectations of extended school facilities, some county councils appear to be seizing the opportunity presented by the fashion for localism to shut these schools. And it is nonsense to suggest that this is all about the government's funding formula: shires have enjoyed big funding increases like the country as a whole, but costs in inner cities are always going to be higher and reflected in funding distribution. There is some unfairness between shires, but the move to a national funding formula while desirable would be too costly if it were not to create a large number of politically unsustainable losers (as Charles Clarke found to his cost in 2003). But their closure is not inevitable. One of the big problems for village schools has been the assumption that each should exist as an independent entity. While such independence is clearly desirable for large secondary schools and many larger primaries, it is less so for small schools. So, for example, there is no good reason why a cluster of village schools should not form a trust to share a headteacher, a governing body and their specialist after-hours activities; that would improve efficiency while ensuring a school within walking distance of villagers' homes. Of course, there will always be schools where their viability is impossible, but a trust school model with several schools could preserve the village school, cost less and improve the choices and facilities for children. It has not been the best of weeks for the Government. What with Peter Hain's resignation, the stock market jitters, Martin Bright's sudden discovery that he didn't like Ken and Polly Toynbee becoming upset that Gordon is building prisons and keeping police pay in check, one might expect Labour to be in the doldrums. But the polls are suggesting something different. Today's ICM poll for the Guardian has the Tory lead down at a mere two points (although another poll suggests a larger if falling lead). In London, Ken has actually extended his lead over Boris. And today we learn that Boris is not exactly whiter than white when it comes to potential conflicts of interest. Today's Irish Times poll suggests that the Taoiseach Bertie Ahern is suffering in personal popularity from the constant scrutiny of the tribunals and the media into his tax and financial affairs. Nevetheless, a plurality of voters think he should stay in office, and support for the governing parties has actually risen despite the story dominating the news for weeks. Unlike Peter Hain, whom nobody suggests has gained personally from any of his late-declared donations to his deputy leadership campaign, Bertie received an envelope stuffed with £8000 worth of £50 notes from friendly businessmen to help pay legal bills, which he regarded as 'no big deal', as well as significant other personal loans, while he was finance minister in the 1990s; as a result he had to give lengthy testimony to the Mahon corruption tribunal last year over several days. He has not managed to get a certificate of tax compliancy from the Revenue Commissioners this year. Yet, while the opposition leader Enda Kenny has been regularly calling for his resignation, his own Fianna Fail party and their allies in the Greens and Progressive Democrats, seem happy enough for him to stay on, although Finance Minister Brian Cowan has established himself as the leader-in-waiting, just in case. Bertie's response has been to attack the main Tribunal and his critics, playing the anti-establishment card beloved of the Fianna Fail establishment. But for all Bertie's travails, it is small beer compared to his mentor, the late Charlie Haughey's corrupt lifestyle. And Haughey was well out of politics before he was called to account, when it emerged that he had acquired over £8 million from business donors to finance his personal high-living expenses (which included a mansion and a private island). It does put things into perspective. Peter Hain was undoubtedly one of the most talented members of the Brown cabinet. But in the light of the Electoral Commission's decision to refer his late declaration of donations to his deputy leadership campaign to the police, he understandably felt he needed to resign as Work and Pensions Secretary. To a considerable extent, this government has been hoist by the petard of its own stricter rules for transparency. Hain is not the first talented minister to be forced to fall on his sword, and he won't be the last. Transgressions that were commonplace under previous governments - but which remained hidden from scrutiny - lead to regular resignations and media frenzies. Yet few believe that British politics is notably corrupt. Far from it: it is much cleaner than most countries, where the events that excite so much coverage here would be laughed off. Of course, it is right to have a system which seeks to ensure the highest standards of probity. But it should be about doing just that, and not an obstacle course designed to catch out the unwary or distracted politician like some sort of macabre version of musical chairs. It is time to reform the whole business. First, as I have argued before, we should bite the bullet on state funding for political parties. Sanctimonious opponents of change should be honest about just how much is already spent by taxpayers on honing the latest soundbite from David Cameron or sermon by Nick Clegg. And we should look at how much the Electoral Commission is costing taxpayers not to fund political parties. We should then restrict individual donations to £5000, with a lower individual threshold for donations made by agreement with members or shareholders by unions or public companies. We should then ban poster advertising for parties, which are surely nor more a wasteful eyesore. A single Commons and Commission register should proactively be updated every month, with each MP actively reminded to do so. The Tories may be gleeful now, but they will face the same problems if they are ever re-elected. For the sake our democracy, we need to get it right, and quickly. 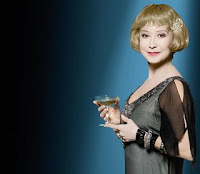 To see a superb performance by Felicity Kendal in Peter Hall's version of Noel Coward's first West End play, The Vortex, in Bath tonight. Hall's taut production sees Kendal (left) as the socialite Florence Lancaster, whose penchant for young lovers comes unstuck when her hedonistic son, Nicky, played by Dan Stevens, returns from France announcing his trial engagement to Bunty. The play's three acts move from a stilted homecoming through an increasingly fraught house party to a dark, but finally hopeful, reckoning between mother and son. Don't miss this excellent production, when it comes to the Apollo Theatre in London from February to June. Martin Bright's Dispatches documentary on Ken Livingstone and his 'court' last night missed the mark for two reasons. First, Bright threw every piece of anti-Ken propaganda, weak or strong, into his story. And second, it was preceded by the over-the-top comment piece in the now very anti-Ken Evening Standard, where Bright maintained he had decided this very weekend not to vote for Ken in the forthcoming Mayoral elections. Nobody could have been in any doubt about Ken's far-left affiliations when they voted for him, and the fact that the Mayor has the powers he has is a strength of the office rather than a weakness. What exactly was achieved for London in the years between the demise of the GLC and his election? Councils couldn't and wouldn't agree anything that they perceived as against their very local interests. The Congestion Charge, winning the Olympics, improved public spaces (at Trafalgar Square, and soon, at Westminster), and better buses are neither to be sniffed at nor discounted because of a £500 room service bill in China or even the Mayor's penchant for a nip of whiskey when facing the GLA. Moreover, in the globalised world, it was hard to see what objection one should have to London having offices in Brussels, India or China. Of course, the Venezualan and Cuban links are cretinous, although they seem perversely to have aided Londoners; the provision of platforms for extreme Islamists is wrong; and the campaign against Trevor Phillips was petty-minded, and wasteful of taxpayers' money. The Mayor also clearly spends rather too much on glossy propaganda. And the voters of London are entitled to weigh all this in the balance when they vote in May. But Bright would have had a more convincing case - and persuaded more voters - if he showed us, for example, rather more of how Socialist Action had misused its position to the detriment of Londoners - if they have done so - and rather fewer Liberal Democrats with an axe to grind or faux-outrageous examples of Ken living up to his cheeky chappy image. I'm delighted to see that cooking is to be made compulsory for 11-14 year-olds in English secondary schools. There were already plans to provide all students with an entitlement to learn to cook, part of a package developed by Tony Blair with Jamie Oliver, but this strengthening of that commitment is right. Of course, schools will need more kitchens. But the most important thing is that children learn how to cook decent meals, and that the dreadfulness of what passed for food preparation in too many 'food technology' lessons is consigned to history. But there are two important issues. First, schools should be ready to allow local cooks to take the classes if they haven't got enough 'food technology' teachers. And second, youngsters who cook the best meals - or bake the nicest cakes - should be able to serve them to their classmates without being prohibited by the sort of absurd health and safety concerns that I have seen in far too many such classes. James Kirkup's idea that the Electoral Commission should be the conduit through which all political donations are made is a neat one. The only thing I disagree with is the idea that the bloated Commission needs more money. It could easily do this task, if it stopped doing a lot of the other jobs it has invented for itself. Jacqui Smith's advisers probably shouldn't have mentioned her trip to a Peckham kebab shop, given that she would have had her protection officer with her. 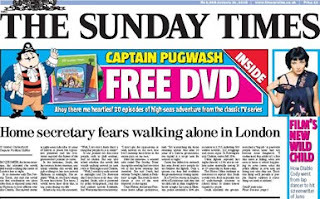 But the idea that it is a gaffe for a woman to say that she would not walk about a strange inner city area alone at midnight (although she happily does so in areas she knows) - even if she does happen to be Home Secretary, albeit the latest Labour one to be presiding over falling crime levels - tells us a lot more about the fatuousness of the British press and our main Opposition party than it does about Jacqui Smith. Would it have been better had Ms Smith declared (presumably to widespread derision) that, of course, she would happily walk the alley ways and back streets of Hackney late at night? And perhaps rent-a-quote David Davis, who ought to have more sense than to dub an honest response 'shameful', could explain to us in which halcyon age it was 'safe' for a woman to do so? Of course, there will be lots of fearless lone women walking the back alleys of London through the night once the Tories are in power. Just as they did in the 1980s, didn't they? Hillary's win in Nevada yesterday doesn't mean she will take South Carolina - Obama must still be the favourite there - but it puts her firmly on course for Super Duper Tuesday in February. And she owes her win not only to women, but to Hispanics and to Las Vegas casino workers, who ignored the union diktats that they should support Obama. Hillary is now even more firmly the favourite to win the nomination; however, she is also more likely to face her toughest potential opponent, John McCain, given his victory in South Carolina's Republican Primary. It will be an extraordinarily tight race if that happens. To see the latest Coen Brothers' violent epic No Country for Old Men last night. Javier Bardam is stunning as the amoral killer Anton Chigurh in pursuit of the Vietnam vet Llewelyn Moss (played by Josh Brolin), who has stumbled across a lot of dead bodies and a briefcase stuffed with $2 million in $100 notes. With several sub-plots, a stellar cast (also numbering Tommy Lee Jones, Kelly McDonald and Woody Harrelson) and amazing photography, this is the Brothers on top form, as the western set in 1980 pans out near the Mexican-US border. I don't think it is as good as either Fargo or O Brother Where Art Thou?, but it is undoubtedly fine film-making, and even if the plot (not unusually for the Coens) lacks any sense of final resolution, it is a rewarding movie. For years, the Republic of Ireland was crippled by a narrow nationalism that fed the economic and social isolationism that kept the country far poorer than its potential suggested. That started to change in the sixties, but since the 1990 election of Mary Robinson and the emergence of the Celtic Tiger, all has changed, changed utterly, to paraphrase Yeats. The President now properly commemorates Ireland's many war dead: when I visited Ypres a few years ago, the names of thousands of working-class Dubliners stood out. When Diana was killed, Dubliners queued up to sign a book of condolences. The Queen is likely to visit Dublin soon, the first such visit by a British monarch for over a century. Nationalist Ireland - at least in the South - is now capable of celebrating its British heritage, because it is self-confident about being Irish. Now, turn to the petty-minded throwbacks that still populate Sinn Fein at local council level, this time in Limavady. Of course, it is true that they are often more than matched by their Unionist counterparts who have sought to deny that Northern Ireland has an Irish as well as a British heritage. However, times are supposed to have changed. So, what message do these councillors think it sends to their fellow Northern Irishmen and women to seek to scrub all memory of one of New Zealand's longest-serving prime ministers, William 'Bill' Massey, and Limavady's most successful sons, because he was a member of the Orange Order? This sort of petty act might have been acceptable in dreary 1950s Ireland. It should have no place in modern Ireland - North or South. I will freely admit that I underestimated Ken Livingstone when he was bidding for the London Mayorship in 2000. His congestion charge, even if its impact has lessened over time, was a bold and wise move for a major capital. Some public spaces, such as Trafalgar Square, are the better for having less traffic. Buses are plentiful, though the bendy-buses are a menace at pedestrian crossings. With David Blunkett's help at the Home Office, London policing is largely better, and most crime is down. In many ways, London has regained the civic identity that it had lost when the Greater London Council was launched. But, there are worrying signs that Ken has retained some of his less attractive practices from the GLC days, and has surrounded himself with advisers who could drag him down. And today's report on the Today programme - following a lengthy series of Evening Standard reports (albeit with the overweaning bias of one Andrew Gilligan, whose reputation precedes him) on unsuccessful companies backed with London Development Agency money - that Ken's race adviser Lee Jasper (right) had been trying to use public money to launch a campaign to discredit Trevor Phillips (left) is deeply worrying. This is said to have happened - and the emails read out on the programme sound pretty clear in these matters - when Trevor was in the running to head the new Equality and Human Rights Commission, a job he now holds. Ken should suspend Jasper now and launch an independent investigation into this and other recent allegations about his race adviser. The danger is that if he pretends these are not important issues, he will hand the election to Boris on a plate. And however entertaining Boris may be on Have I Got News For You, I'm with Luke Akehurst in his assessment of what his election would mean for London. Of course, the Schools Minister Jim Knight is right to remind schools that they must abide by the new Admissions Code, which is on a stronger statutory basis than before. But that doesn't mean that abiding by the Code will secure fair admissions. Most schools will use either distance or sibling criteria to admit students; and for many schools, especially those in rural areas or market towns, that makes good sense. Oversubscription is often not as big an issue in such areas. But in urban areas, this is neither fair nor does it secure choice for parents. That's why the Code gives encouragement to random allocation (or a 'lottery') and banding by subject ability; using either (or a combination of the two) gives all parents who live within a reasonable distance of a secondary school a fair chance of getting into that school, without taking into account their ability to buy an expensive house next door to a school or any other subjective criteria. The fact that Brighton introduced a rather peculiar version of random allocation should not deter other schools or local authorities from considering such approaches. Mitt Romney, the unimpressive flip-flopper who has tried to disavow his relatively liberal governorship of Massachusetts, should savour his Michigan victory (or 'comeback' as he tried to call it, though it wasn't clear from what). Democrats - both Clinton and Obama supporters should do so too - because the truth is that the only Republican who has much chance of defeating a Democrat for the White House is John McCain. All the polls show the two Democrat front-runners substantially beating Romney, Huckabee, Giuliani (who seems to have blown his chances) and the ridiculous Ron Paul. But several still put the independent-minded McCain ahead (though CNN recently had him behind). So let's hope the Republican voters continue to muddy the field to give Hillary (or Obama) a clear run. It looked slick and had more of a professional feel to it than most current ITV news bulletins. But it wasn't clear that the new News at Ten was much more last night. Instead of news, we were treated to a dreary exclusive about a boring doctor who was 'Diana's great love', and who shared a tale about when she popped in for tea; a travelogue from the senior international editor down a hole in Antarctica; and an OTT piece about Treasury frustration from ITN's distinctly lightweight 'political editor' Tom Bradby (bring back Mike Brunson!). None of which could disguise the fact that ITN is no longer what it was, and that it lacks the great reporters of the seventies and eighties. Sir Trevor and Julie Etchingham are good presenters, and benefited from sitting down in front of a desk looking authoritative, but little of the content was really news. Despite his occasionally infuriating biases, I think I'll stick with Jon Snow - a great ITN reporter in his day who would put the present lot to shame - and the still superior Channel 4 News. Hillary Clinton had to spend rather a lot of her interview on Meet the Press yesterday defending herself against ludicrous accusations of racism from allies of Barack Obama. Her pretty obvious point that it was LBJ, as president, who implemented Martin Luther King's civil rights plans and husband's Bill's accusation that the media were buying a 'fairytale' when they failed to question Obama's claims of consistent opposition to the Iraq war, were morphed into racist jibes to discredit the national post-New Hampshire frontrunner in the eyes of African-American voters in South Carolina. Hillary gave a good account of herself yesterday. And Sean Wilenz has an excellent piece of contextual history on the New Republic website today. But it is pretty shameful that Obama - who presents himself as the great 'uniter' - has not disowned his allies' discreditable campaign of lies and distortion. Are we witnessing the dumbing-up of television? After a decade of round-the-clock 'reality' TV shows and schedules hijacked by home and fashion makeover shows, can we really be witnessing a dumbing up of terrestrial television? Tonight sees the return of News at Ten, while last night, BBC 1's schedules included an entertaining adaptation of Flora Thompson's Victorian rural drama, Lark Rise to Candleford, the final episode of Andrew Davies's delightful Sense and Sensibility adaptation and the classy Glenn Close legal drama Damages. Cranford enjoyed audiences to match anything else on TV when it was on. Meanwhile, Big Brother has been exiled to E4. It is true that we are still stuck with a very inferior version of Panorama, and there remains a lot of dross in the schedules; but these must be hopeful signs that the TV bosses have recognised that they underestimated the intelligence of their viewers for too long, and must now make amends. Exiles to BBC 4 should now be free to return to the mainstream (at least occasionally). In that excitable way it employs to push non-stories onto the front page, today's Times informs us that teachers are to be 'told not to promote A-levels'. A clause in today's Education and Skills Bill says that teachers should not 'unduly promote any particular options'. According to the Times, this is just a sneaky way of helping Diplomas gain a foothold, and undermining A-levels. But, if that were the case, wouldn't the Government be requiring teachers to promote Diplomas? The government is right to expect impartiality from schools, not least because one big problem with the current system is that teachers are persuading pupils to go on AS level courses in order to win extra resources for the school sixth form, when a college-based vocational course might be a more suitable option. Many such youngsters drop out before taking full A-levels. 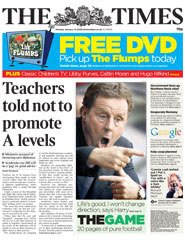 The Times headline might just as easily have read 'Teachers told not to promote Diplomas'. But then that would hardly have pushed the story onto the front page, would it? After the post-Iowa wobble, Hillary Clinton has regained a 13-point national lead over Barack Obama in the latest CNN poll - a higher lead than she enjoyed on that poll in December. More interestingly, Democratic voters are significantly more enthusiastic about a Clinton candidacy than they are about the prospects of an Obama candidacy, and far more enthusiastic than the Republicans are about their potential candidates, including John McCain. Clinton would also beat all the Republican candidates, including McCain. Her comeback is complete (though Obama is still likely to win South Carolina). Naturally the BBC is wanting to downplay the news that George Osborne has been concealing the funding - worth nearly £500,000 - for his office from his fellow MPs (and it is not the same thing to publish the information in the Electoral Commission files) but David Cameron had a hard job keeping a straight face on the Andrew Marr show telling us that Osborne's omission was 'totally different' from Peter Hain's failure to publish his deputy leadership donors on time. But then Dissembling Dave also had to concede that there would not, in fact, be a referendum on the EU Treaty if he was elected, assuming (as is likely, unless my fellow countrymen try again to prevent poorer Eastern European countries from enjoying the benefits that Ireland gained from EU membership) that all the other EU states had ratified it by that stage. Quite right too, but I'm not sure all his MPs will agree. So, to be clearer than Dave was to the likes of John Redwood and his fellow Eurosceptics, there will not be a referendum on the EU in the still unlikely event that the Tories win the next election. 45% of other schools, while 49% of Catholic secondary schools were judged to have an excellent or very good ethos, compared to 32% of other schools. They were a great vehicle for social mobility and helped many young people to escape the relative poverty of their parents. It is for that reason that I support faith schools for other communities, such as Sikhs, Jews and Muslims, and provided the right safeguards are in place to guard against extremists and ensure a balanced curriculum, I favour their expansion where there is genuine parental demand. But it is not for government to create this demand - which is why Ed Balls was right to answer as he did at the Select Committee (whose chairman is not a fan of faith schools) - but is for government to respond to that demand where it can reasonably be met. A Labour government should be proud that it created the first state schools for faiths other than Christians and Jews. It should not be unwilling to continue to do so. If Barack Obama is to recover from his defeat in New Hampshire - and he must be the favourite at least in South Carolina - surely he can do better than trumpeting the endorsement of one of the most unimpressive Democratic losers of recent memory? One of the least understood, but most radical, changes to schools over the last ten years has been the much greater amount of factual information that teachers have about pupil progress and potential. Critics of tests and tables partocularly fail to recognise this. Most teachers can now use the data easily to set challenging but realistic personal goals for students, track how well they are meeting them, and exhort improvement where necessary. Having such data - where it is used to raise ambition, rather than to instil satisfaction with mediocrity - also means that parents can be kept much better in touch with their child's progress than has hitherto been the case. Bland or subjective school reports have been replaced with more objective facts. That's why the 2006 Education Act required schools to report home at least three times a year, and it is why it is excellent news that the schools minister, Jim Knight, is giving the idea such a push today. I have seen in schools like Shireland in Smethwick just what IT can do to transform home-school relations (as well as pupil achievement). Such innovation should now become the norm rather than exception. Daniel Finkelstein offers a definitive explanation of why the pollsters blew it in New Hampshire. And for those who have been intoxicated by his campaign, Andrew Stephen cuts through the hype about Obama in this week's New Statesman. Although there is a bit too much of the standard NS-sneering at someone on the liberal-left they probably thought would be a winner by the time the piece appeared, it is a far more credible piece than that by James Forsyth in the Spectator, who assured us just days ago that Obama was the most likely Democratic nominee. Meanwhile, the polls still put Obama ahead in South Carolina - although his lead is slipping - and Hillary ahead in Nevada despite some prominent union endorsements for Obama. But once the next few states are out of the way, it is hard to see how Hillary will not be the candidate. She already has significantly more delegates than Obama, when the non-state delegates are included. And she has huge leads in the big states. What New Hampshire has given her is the edge and voice she needed to see her through these contests. And for that she can probably thank the voters of Iowa. Since their introduction in the early Nineties, the teaching unions have bemoaned the ‘damaging impact’ of school league tables. But, as the clamour for their abolition grows again, the unions’ case is weaker than ever. They initially complained that an absence of context made the tables unreliable. Yet, as the Government added improvement indices, average point scores and an assessment of the value added by individual schools, they were not appeased. All of which suggests that the real reason they don’t want parents and the public to have comparative information about schools is that they have something to hide. 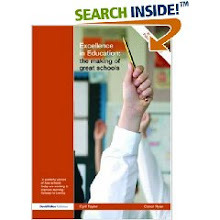 published school-by-school in 1995 they exposed those that were coasting, encouraging real improvement in the 3Rs. The sophistication of today’s data now means that schools’ performance is compared with the achievement of similar schools. Fischer family trust and value added data enable teachers to set challenging but realistic goals for every pupil in all their subjects. The best schools involve parents in this process. Tables encourage scrutiny and openness. If this information were not public, the pressure to succeed would be weakened. Failings would not only be hidden from parents and the wider community, but from many school governors. Tables can also support public policy goals with minimal bureaucracy. Last week, Lord Adonis announced that information on pupils achieving level 6 and 7 in the Key Stage 3 tests would be published to encourage attention for gifted and talented students. Ruth Kelly’s decision as education secretary to include English and Maths scores in the preferred GCSE measure has rightly focused more attention to the basics. Equally, it is unrealistic to expect that newspapers should not publish the results. Most now celebrate fast improvers as much as they highlight the lowest achievers. Rather than trying to abolish the tables, their union critics should be encouraging their members to make the most of the wealth of information they contain to improve standards for every child. And, for those, including the BBC, who report that a fifth of schools are still failing to meet Gordon Brown's challenging target that 30% of pupils in every school should get five good GCSEs, including English and Maths, two points. 1. Given that the target was set after pupils sat the exams on which schools are being judged for today's league tables, how can they still be failing to meet a target that they didn't then have? 2. By the same token, half of schools missed this target in 1997. Why is that not reported? So, Hillary has won. Until two days ago, Hillary Clinton was ahead in most New Hampshire polls. But even they seem to have got caught up in the ludicrously unquestioning media support for Barack Obama. This blog has been more sceptical, but managed even to fall victim to the polls in its assumptions. Last night's Channel 4 News was a particularly egregious example of this phenomenon, with a report that combined offensive images designed to illustrate 'loser' Hillary, a pointless foray into a coffee shop with 'typical' Republicans for Obama and a two-way between Jon Snow and Sarah Smith that sneeringly wrote Clinton off. By claiming victory early, Obama has shown his ineptitude; by winning, Hillary has shown the strength of her Get Out The Vote operation. Hillary should now win the nomination. What is it with newspaper front pages these days? 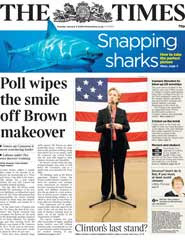 Today's Times proclaims that its poll will wipe the smile off Gordon's makeover. Really? Given that it places former PR-man Dave Cameron's 'new' Tories just four points ahead of Labour - a fact buried at the end of a tendentious story - and that much sampling was done before the PM's impressive New Year foray began, why should that be? Peter Riddell has a rather more sensible take - as one would expect - within the paper. It is true that Cameron does well on some personal characteristics. But with a strong new chief of staff in no 10, whose role includes strategic communications (something I have argued was needed) and some very strong messages on the NHS and pay policy over recent days, Cameron is the one who should be worried. In fact, given how his elevation has hit the Tories, all we need is for Lib Dem leader Nick Clegg to do something popular and the Tory lead could be wiped out. It looks like Barack Obama will sweep New Hampshire, and that Hillary Clinton could struggle to rebuild momentum ahead of Super-Duper Tuesday, in the face of an Obama-adoring media and its traditional hostility to pragmatic liberal candidates. But, as Danny Finkelstein recognises, Hillary ain't dead yet. And I wonder whether David Aaronovitch doesn't also have a point in another brilliant piece in today's Times? In case you were under the mistaken belief that the break-up of Respect had anything to do with the comrades reeling in horror from gorgeous George's decision to abandon Bolshevism for Big Brother, Comrade Murray Smith will shake you out of your bourgeois deviationism. Like Paul Anderson, I didn't realise such drivel insightful analysis was still being produced in the early 21st century. The Daily Mail and the Tories are in high dudgeon this morning because Lyn Homer, the chief executive of the Border and Immigration Agency decided that a Chinese student - someone who contributes thousands of pounds in fees to the UK economy and higher education - who had applied for an extension on her visa, but had filled in the form (doubtless one of impeccable clarity) incorrectly should not be deported. Ms Homer told the Today programme that she had exercised her 'common sense' and asked her officials to do the same. Instead of demanding that immigration officers should behave like mindless jobsworths, shouldn't the Mail and Tories be hailing this refreshing example of bureaucratic flexibility? I have a piece in the January issue of Parliamentary Monitor about the Prime Minister's education priorities. You can read it here. The Prime Minister was on fairly good form on the Andrew Marr show this morning, once he got away from sounding like the former Chancellor talking about the economy. He was particularly good when he upstaged Marr's cynicism over hospital cleanliness by clearly describing the government's plan to address the problem. But he was less convincing when he started trying to set himself up as the politician with the right long-term solutions. As Matthew Parris suggested in an insightful piece in yesterday's Times, what the government now needs is to demonstrate competence in a number of areas - hospital cleanliness is probably one. Brown should set his more able ministers the task of sorting out perhaps ten to a dozen problems that really bug voters, over the next eighteen months. By all means, let's have the grand plans for 2020, but we need a set of challenging but achievable goals that the government can deliver by 2009, some very clear delivery plans and a tough line with recalcitrant civil servants. By doing so, the government can regain its reputation for competence - and the narrower Tory poll leads at the end of 2007 suggest this is not as hard as some commentators seem to think - as well as exposing the shallowness of the Tory strategy which is all about 'leaving it to the professionals' to decide whether or not they want to cut waiting lists. We went to see Ang Lee's controversial tale of wartime espionage in Japanese-occupied Shanghai, Lust, Caution, last night. 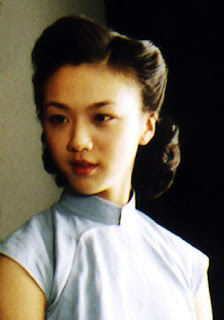 The film is, as one would expect from the director, beautifully shot, and wonderfully evocative of middle class Shanghai and Hong Kong in the thirties and forties; the acting, especially by the gorgeous Tang Wei (left) as the conflicted resistance agent, Wong Chia Chi, is marvellous; the insights into a part of the war of which we know too little are suitably revealing; and the hype around the sexual scenes, though provocative, has been typically overdone. But in this tale of lust and betrayal, the real problem is with the film's length and plot: it is too long and too slight a tale to be one of Lee's masterpieces. It is, neverthless, a cinematic treat that is well worth a visit. However much Jim Naughtie wishes to affect surprise at his victory, Barack Obama was always the most likely victor among Democrats in Iowa. And John Edwards had staked his whole campaign on winning the eccentric caucus there. So we would be foolish to get carried away with the excitement of Obama's undeniably good result in this bizarre contest. Hillary Clinton remains well ahead in most states with large numbers of delegates, and with the big contests over by early February this year, it is likely that the Iowa contest will appear rather less important within a matter of weeks. UPDATE: Andrew Stephen has a characteristically sharp analysis on the situation on the New Statesman website, not least on the foreign policy nous of the two Iowa victors. When is a U-turn not a U-turn? According to yesterday's Times, Gordon Brown is likely to perform a 'u-turn' over so-called 24-hour pub opening. Since Brown had promised a review of the deregulation of licensing laws, which made it possible for the average pub to open until midnight at weekends without difficulty, and that review seems set to conclude that the laws should not change, our Prime Minister has apparently performed a U-turn. Given the Prime Minister's proclivity for reviews, and assuming that a fair few of them have the independence of leadership to reach their own conclusions, we must be in for a lot of u-turns in 2008. What a relief for lazy headline writers! Returning to Heathrow from Munich last night, we were greeted amidst the building site that it Terminal 1 by posters proclaiming that BAA is 'working towards an airport we can be proud of'. The terrible grammar is not the only thing wrong with this corporate guff. We left Heathrow on December 23 and were fortunate enough to find, amidst the fog, that our flight was only thirty minutes late departing (other flights to Munich had been cancelled that day). But spending a few hours in the airport before being allowed into the Departures lounge was like entering hell. There was no attempt to provide coherent information. There were no clear queues for check-in or baggage drop desks. Trolleys blocked the limited space between desks and shops. Thousands of people aimlessly wandered about not knowing what was happening. On our return, we faced confused baggage return carousels, lengthy EU immigration queues and being forced to pay £15.50 for the ghastly Heathrow Express listening to video exhortations to passengers to visit Bognor Regis (I jest not) as the train meandered slowly past 'signal problems at Hayes' into Paddington, having apparently cancelled the rather better value Heathrow Connect. We are told that Terminal 5 will be the answer to all our prayers. I'll believe it when I see it (though where possible I shall use non-BAA run Bristol instead). Meanwhile, is this really the great welcome that our visitors are promised? Andrew Adonis, the schools minister, has started the new year well with his plan to publish the achievements of the ablest students at Key Stage 3 in the annual performance tables. Secondary heads' leader, John Dunford of the ASCL, grumbles that schools don't really take the tests at 14 seriously. But with English and Maths now properly recorded in GCSE tables, they are increasingly going to do so. So, combining them with the gifted and talented programme is surely the sort of joined-up thinking of which he ought to approve? Our horse-drawn sleigh brought us through the snow-covered roofs of Garmisch Partenkirchen, past the ski jump slope that would be seen around the world the next day, and through snow-fringed streets that evoked the Christmas of a hundred idealised winter holiday movies. We spent the Christmas and New Year in this Bavarian Winter Olympic resort, and thoroughly enjoyed the experience, from sipping gluwein at the Christmas market on Christmas eve to seeing in Christmas day with a splendidly sung mass at the Martinskirche, as the snow clung not only to Germany's highest mountain, the Zugspitze, but surrounded the eponymous family-run hotel where we spent ten days. The resort is large enough to embrace dozens of restaurants - the best is Isi's Goldener Engel on Bankgasse; but there are several great pizzerias including Pizzeria Max on Griesstrasse. Our hotel, the Zugspitze, laid on excellent meals (and itself has a great restaurant) and good Christmas and New Year entertainment. Visiting the town, it is also essential to take the cogwheel train up the Zugspitze mountain, and having a meal on top (as non-skiers, there is still plenty to entertain; for skiers, the facilities are excellent) and to visit the Partnachklamm glacier. The town is really two towns merged, and the Partenkirchen side is full of splendid examples of houses and shops decorated with wall paintings in the Luftmalerei style; it is also worth visiting the excellent local Werdenfelser museum with plenty of local artefacts and recreated merchants' rooms. Garmisch is nearer to Innsbruck than Munich; we found it easier to get a Munich flight, but were pleased to be met late evening by a charming Garmisch taxi driver, Klaus Weisbrich, though there is a regular rail service available. Garmisch is the place for an excellent white Christmas.